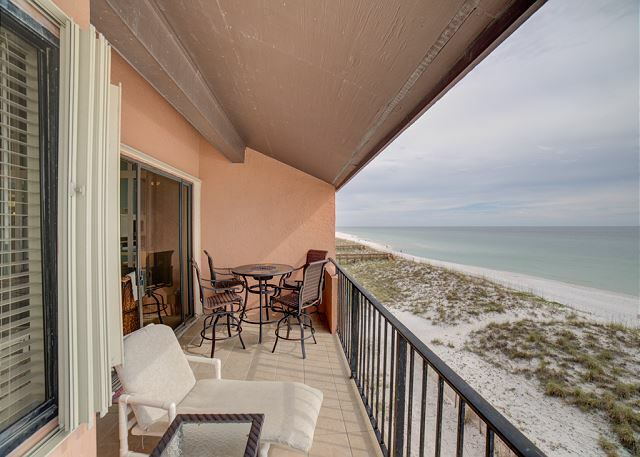 The views from this Gulf front 4th floor Condo at Gulf Winds 404 are truly amazing. The main level includes the living room, dining area, kitchen, bedroom with queen bed and bathroom. 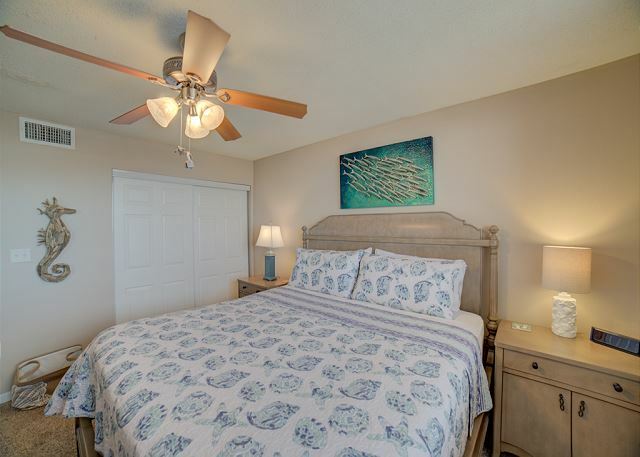 The spacious loft-style master bedroom offers a king bed and private bath. The staircase to the master loft is a tight spiral staircase. 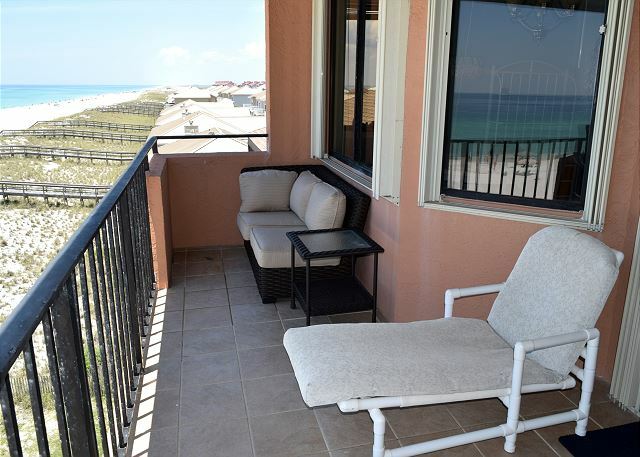 Enjoy the amazing Gulf views from the private balcony. Washer and dryer is located off of the living area for guest convenience. There is assigned garage parking under the building for one vehicle and lot parking for and additional vehicle. 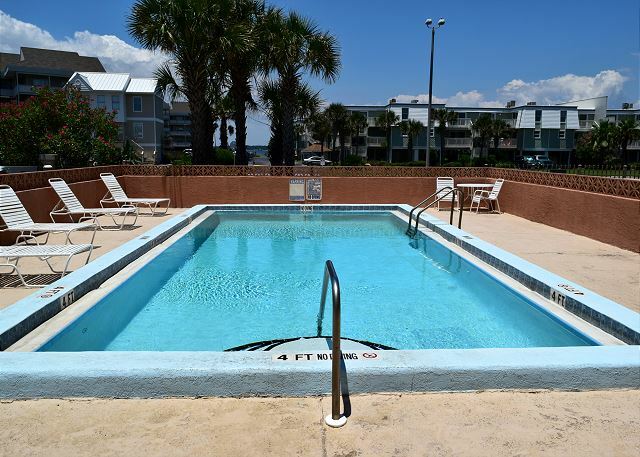 Gulf Winds offers a community swimming pool for guest enjoyment. Paradise Beach Rentals is a wonderful group to work with. They are professional, knowledgeable and friendly. We experienced a couple of small issues during our stay . . . the problems were addressed immediately. I highly recommend this agency if you are planning on looking for rental property in the Pensacola area. Thank you so much for posting your review Laura! It sounds like you had a wonderful vacation and we're so glad to hear that you were happy with our services. We want nothing but the best for our guests! We hope to see you again very soon! The unit was clean and nicely decorated. The spiral staircase to the master suite is a little narrow and steep for old folks but the young folks had no difficulty with it. The digit locks were very convenient. Everything worked and we even had great weather. Paradise personnel were very helpful. 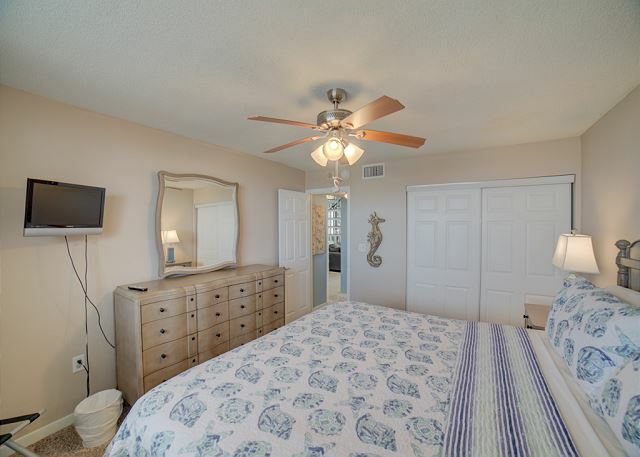 We're so glad to hear that you enjoyed your stay at Gulf Winds 404. We look forward to your return! We had a great stay, weather and water were wonderful! I would only add that the upstairs bathroom of the condo, really, you can't shower in it, so we had to have all 4 adults shower downstairs. Thank you for posting your review. We appreciate the feedback and hope to see you again soon. Arrived and was checked in quickly. The condo was just what we expected. We have stayed in this unit under prior management often. While we enjoyed our stay, it was not up to the prior amenities. But, I must say the wifi was the best I have ever experienced in a condo or motel. I left suggestions in writing with the agent when we left. Thank you for your review. We appreciate the feedback and hope to see you again soon. I gotta say this condo was breathtaking! It was so nice and clean when I arrived during the Blue Angles weekend. The stairs is a bit tricky going up since its a spiral staircase. It took me a while to take my luggage up. When I got to the top I noticed that there was a rope on the side with a hook to bring thing up and down over the railing. Wish I would have seen that because it would have made it easier! The only thing I did not like is that the upstairs shower does not have a curtain. The tub is against the wall in which the ceiling is slanted so be careful not to hit your head. I tried not to splash too much water on the floor when using the shower head. Other than the shower upstairs, everything was great. Nice view of ocean on the balcony. I will definitely come back to this specific condo! It was very cozy and comfortable, made great memories! thanks you guys! Thank you for posting your review! 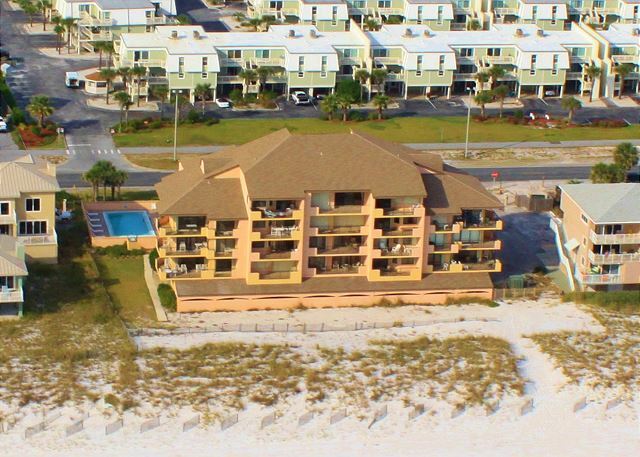 We are so glad you enjoyed your stay at Gulf Winds 404 and we look forward to your return! Daughter, Son-in-Law, grandsons (13 & 4) from Atlanta had a great beach week. Thank you for posting your review. 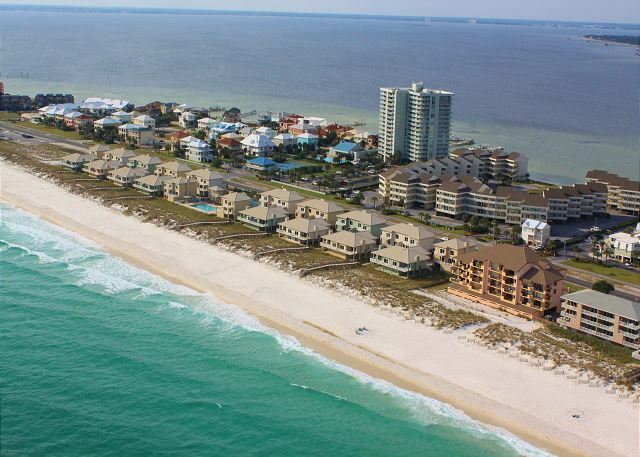 We're so glad you enjoyed your stay with Paradise Beach Homes and look forward to your return! Thank you Melissa we are so happy to hear that you enjoyed your stay at Gulf Winds and look forward to seeing you on your next visit! 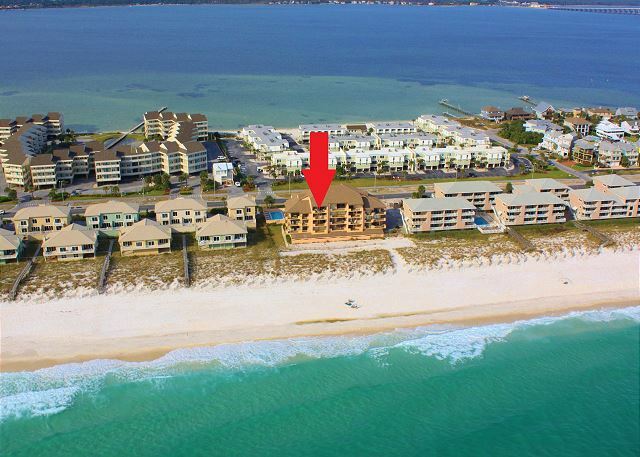 This piece of property was right on Pensacola Beach looking out to the gulf! The decor inside the 2 bedroom condo was adorable with plenty of kitchen things for your convenience. 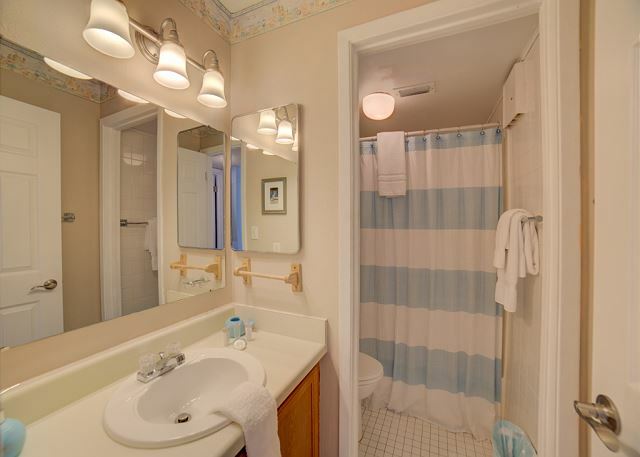 Beach towels were included and two hair dryers for each bathroom. The spiral staircase up to the master bedroom might be difficult for some but really added space to this top floor condo. Two sleepers sofas that were not used would allow for 3-4 more to sleep if needed. We had 4 staying and enjoyed the king and queen beds that were very comfortable. The condo had a private gate to beach and a small unheated pool. There were plenty of beach chairs, bogey boards and floats in the parking garage to use if needed. Paradise Beach Homes management provided excellent directions to their office and were quick to get you checked in and on your way. They also provided Google directions to find your rental plus gave you a waterproof beach bag with chips and salsa, coffee and microwave popcorn. There was a Tom Thumb market a short 2 blocks away on the other side of the road for picking up quick groceries. We shopped at the Publix in town. Because we were visiting our daughter on the other side of bridges near the Navy Base, traffic was quite a problem. There is a new bridge being built next to existing one which had one lane closed at night making it slow to get across. The other bridge to get to Beach area where the main tourist area is was a toll bridge. On a busy warm Saturday it took 45 mins to get across where some days only took 5 mins. We were there the week before Easter so was quite crowded. Even our two mile road would get backed up when everyone left the beach late afternoon. The beach was very clean and beautiful. No lifeguards sit on beach. A lifegaurd truck patrols the beach instead. The condo needed a few updates? Patio door and screen were hard to open and close. Screen would easily fall off. First floor bedroom door was needing a hinge tightened. Nothing major. 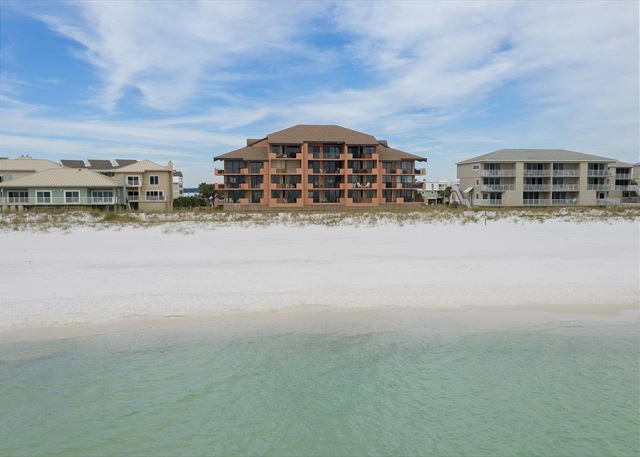 Thank you for choosing Paradise Beach Homes. 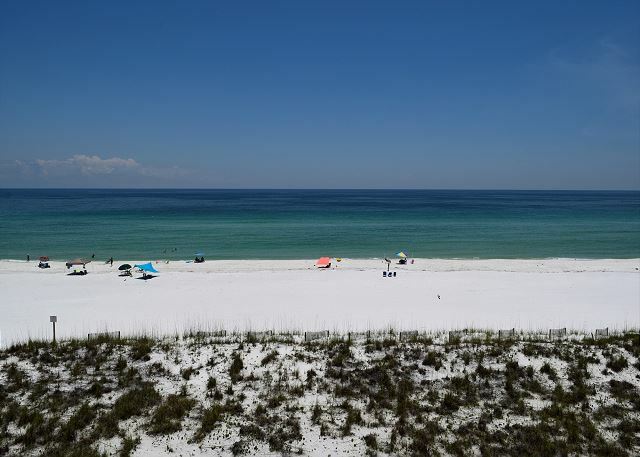 We are glad to hear you enjoyed your stay at Gulf Winds 404 and look forward to seeing you on your next visit to Pensacola Beach! Nice, clean, comfortable and beautiful view! Nice condo. Exactly what we were looking for in a beach girls trip getaway. The only hiccup was a blender with missing parts, but Paradise rentals handed the obstacle and gave us a brand new one to use. I would definitely stay here again. Thank you Mona, this was a great choice! PBH went above and beyond to ensure a relaxing and amazing vacation for us. The booking & check-in process was easy. They recommended this condo and it was perfect! 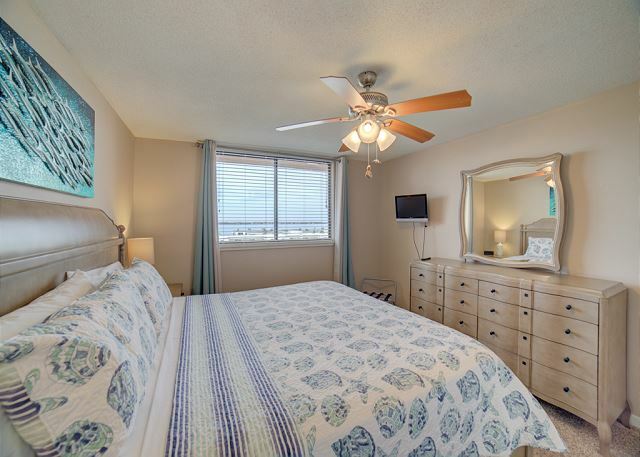 The condo was clean, convenient, safe and offered all the amenities we could ask for. Will definitely rent from PBH again!